Hackensack Meridian Health Jersey Shore University Medical Center in Neptune, New Jersey stands out as the Jersey Shore’s premier not-for-profit health care facility. Hackensack Meridian Health has consistently been rated among the top performing health systems in New Jersey for clinical quality. Jersey Shore University Medical Center’s inpatient psychiatric unit (Rosa 2) is a 29-bed unit with 26 voluntary beds and 3 Short Term Care Facility (STCF), or commitment beds, which treats adults suffering from psychiatric and emotional disorders. The primary therapeutic services include: psychopharmacologic management, individual counseling, creative/expressive therapy, recreational therapy, occupational therapy, group therapy, family therapy, drug and alcohol education and a wide variety of educational programs. Jersey Shore University Medical Center also houses a child/adolescent day program, an active geriatric service and a busy psychiatric emergency room. We also have a robust neuromodulation service which provides patients treatment with electroconvulsive therapy (ECT) and/or Deep Transcranial Magnetic Stimulation (d-TMS). The Psychiatric Residency Program at Jersey Shore University Medical Center has been established to provide a comprehensive and innovative clinical environment in which residents learn educational knowledge, clinical skills and the professional attitude needed to practice psychiatry. Thank you for your interest in our Psychiatric Residency Program. Residency program applications will be accepted and reviewed only via ERAS(Electronic Residency Application Service). Resident well-being is an important component of the Hackensack Meridian Health Jersey Shore University Medical Center residency program in psychiatry. At a hospital-wide orientation, residents will be educated about the importance of leading a healthy lifestyle, tips on avoiding burnout and the availability of counseling and mental health services. Jersey Shore University Medical Center is currently participating in the Alliance of Independent Academic Medical Center’s (AIAMC) Initiative VI with a focus on Institutional Well-Being. Residency Program Director, Stacy Doumas M.D., is a member of the committee that is presently piloting the project at Jersey Shore. Wellness initiatives from this project will be instituted throughout the hospital system. During the PGY1 year, psychiatry residents will also have didactic sessions on Spirituality in Healthcare and participate in small process groups called “Reflection Rounds” co-facilitated by a chaplain and a psychiatrist. A wellness newsletter, social events and access to Hackensack Meridian Health’s integrative medicine department are also part of the psychiatry department’s resident wellness program. The Psychiatric Residency Program is a four-year ACGME accredited program along with a planned two-year residency training program in child and adolescent psychiatry. The curriculum lays its foundation in the six core competencies established by the ACGME. These competencies incorporate patient care, medical knowledge, practice-based learning and improvement, interpersonal and communication skills and a system-based practice. Welcome to the Department of Psychiatry at Jersey Shore University Medical Center, part of Hackensack Meridian Health. 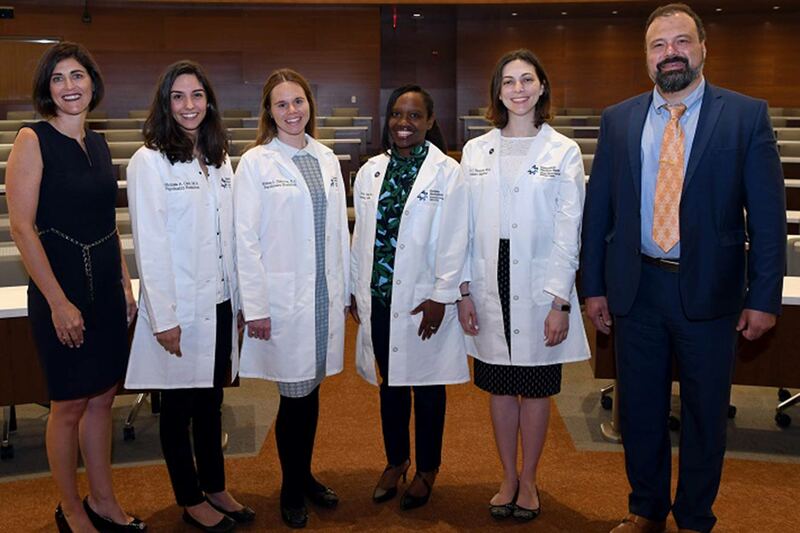 As a recently ACGME accredited program, we welcomed our first class of residents in July 2018 and joined the long tradition of graduate medical education at Jersey Shore University Medical Center. It is our mission to train psychiatrists who are competent to provide compassionate, evidenced based patient centered care. We will help residents pursue their interests and prepare for their ideal practice, whether it is in child psychiatry, research, academics, community psychiatry, neuromodulation, or another area of psychiatry. Our program offers rich clinical experiences at a university hospital in addition to small class sizes allowing for individual faculty supervision and mentorship. We have an excellent grand rounds program, a strong clinical research department, dedicated teaching faculty and a focus on physician wellness. Highlights of our clinical programs include a modern neuromodulation service, a pediatric psychosomatic experience at K. Hovnanian Children’s Hospital, and a fabulous integrative medicine rotation. Our affiliations with many institutions give residents the opportunity to teach medical and physician assistant students and continue to strengthen our innovative interdisciplinary education programs. Located in beautiful Monmouth County, New Jersey, Jersey Shore University Medical Center is in one of the state’s most sought after areas. To the east it is just 2 miles away from Asbury Park offering a thriving downtown and famous beach and boardwalk areas. To the west Monmouth County opens up into a sprawling countryside with horse farms and county parks. New York City is only one hour and Philadelphia is 80 minutes away. I am honored to serve as the Vice Chair of Education and the Residency Program Director for the Department of Psychiatry at Jersey Shore University Medical Center. Please apply to our residency program and reach out to us with any questions. I am looking forward to welcoming a diverse, talented group of residents next year!